Dr. Gelman has been an invited speaker at numerous international Urology meetings and has educated other Urologists on how to best manage urethral strictures with urethroplasty surgery, treat Peyronie’s Disease, other disorders of penile curvature, and erectile dysfunction. He has served as a invited expert speaker in Kyoto and Fukuoka, Japan, Brazil, Australia, Germany, India, and other countries. In addition, Dr. Gelman has been an invited Visiting Professor and teaching surgeon at Universities in the United States including Tulane, the University of Utah, USC, and UCLA where the demonstrated reconstructive Urology surgeries to Residents in training at those institutions. 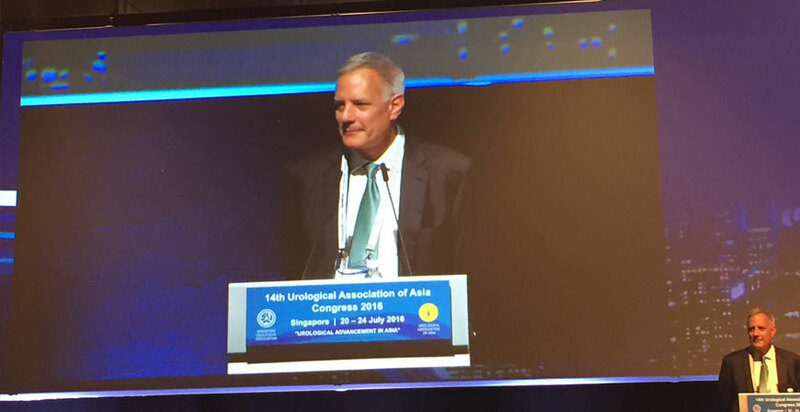 Dr. Gelman speaking before an international audience of Urologists at the Urologic Association of Asia Congress in Singapore.